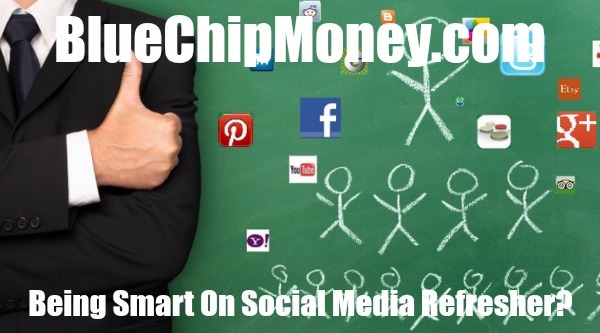 Millennium 7 Publishing Co.: Being Smart On Social Media Refresher? Being Smart On Social Media Refresher? It's not just your friends checking your social media accounts. Did you know that many employers and colleges are now viewing your accounts? Being smart on social media may seem like a no-brainer to many, but every now and then we all need a reminder of smart choices when posting, sharing, tweeting and snapping. Alyse Eady interviewed Double R Communications Professionals President and CEO, Reggie Roberts about the "do's and dont's" of social media. Reggie Roberts was an NFL communications executive for 29 years. In that role, he advised players about their use of social media. In addition to his expertise in communications and football, he is also the father of two teenage sons and is aware firsthand of the mistakes many teenagers and young adults make when using social media. His key tips are below. You guys are in high school. You break up and make up seven times per day and that's all before 3rd period!!! No need to discuss and broadcast your personal drama for all the world to see. Complaining about authority figures screams immaturity. Set up a meeting with the person you have an issue with. 4. Pictures of You Doing Drugs or Drinking Alcohol. There is a rumor swirling about in cyberspace about potential employers or college recruiters routinely checking the social media sites of prospective student athletes. NEWS FLASH!! -- IT'S NOT A RUMOR!! No matter how beautiful or hot you think you are, the whole world doesn't need to see you in the buff. Do us and yourself a favor -- resist the urge to be photographed without your clothes. Posting your cell number, your home number, your home address, and SSN's online = IDENTITY THEFT!! Be smart - don't be a victim. You Are Rich.& Your parents Are Rich. Congratulations. Thank the good Lord for your good fortune and shut up about it. Please do us all a favor and spare us the details. You have just come up with a brilliant idea that could make you a millionaire. You then post your idea on Facebook (without copyrighting it) only to have it stolen by someone else who runs with your idea and copyrights it as his own while you are at the beach. Keep your mouth shut about what you are working on, and get your ideas patented or copyrighted. The moment you post that picture of your teammate sleeping on the bus with his/her mouth wide open is the moment when he/she posts an even more embarrassing picture of you during one of your bad moments. Be a good teammate - don't do it. Also, don't post images that could get you arrested, expelled from school, kicked off of your team, ignored by college recruiters. Guest Authored By Tanya Mendoza. Tanya is a Journalist at Fox 5, Atlanta, GA. Follow Tanya on Twitter. “Being smart on social media may seem like a no-brainer to many, but every now and then we all need a reminder of smart choices when posting, sharing, tweeting and snapping.."
For more information on Reggie Roberts email him here.